High-end city bike suitable for touring. The matte black Raise RT7S is an every-day all-rounder for commuters and frequent riders. The reliably proven Nexus 8-speed hub gear with freewheel shifts precisely into the finely tuned gears. 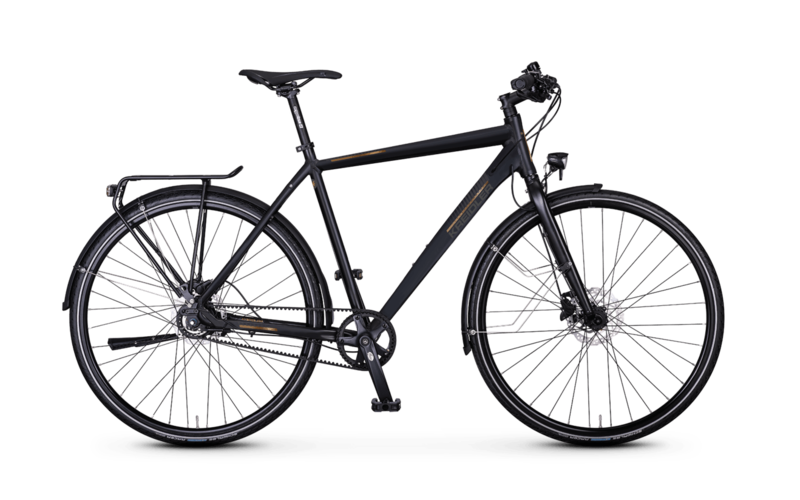 In combination with the low-maintenance Gates belt drive, this city bike is also ideal for longer tours out into nature. Always safe and comfortable on the road: The Shimano disc brakes with 160 mm discs decelerate powerfully and precisely. The proven Schwalbe Marathon Racer tyres ensure the perfect precision grip. The saddle from Velo and ergonomic Herrmans handles with screw clamp stand for best quality and highest comfort. The equipment package is rounded off by an LED lighting system with parking light, robust mudguards from SKS and a practical Racktime luggage rack. Every day, every way - the RT7S is ready to accompany you reliably in everyday life and leisure!